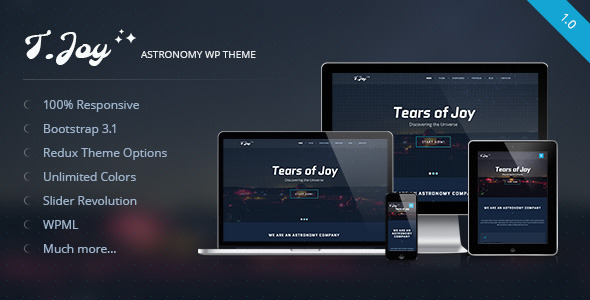 T.Joy is a first Astronomy Responsive WordPress Theme. It is designed in dark color scheme to represent you company. Perfect for astronomy companies, agencies, blogs and space-oriented site. But don’t feel restricted! It can be customized easily customize to suit your needs. T.Joy includes one of the greatest options panel – Redux. You can easily change any theme color. T.Joy comes with Revolution slider, 3 homepage layouts, 2,3,4 columns portfolio layouts, 5 blog pages, Contacts page, bunch of Shortcodes and more. This entry was posted in miscellaneous, wordpress and tagged astro, astronomy, cosmic, dark, earth, galaxy, moon, planet, research, space, stars by Acty. Bookmark the permalink.